We manufacture and export a wide range of Chemical Plant Reactors for chemical plants manufactured from 300-grade stainless steel, cladded plates (Eg - SS316L cladded on SA516 Gr 70). Available in various specifications, these meet the demands of chemical, fertilizers, food and dairy, petrochemical, pharmaceutical, chemical, pulp and paper. Our range of Chemical Plant Reactors is available for both heat transfer arrangements and mixing arrangements. These are manufactured from 300-grade stainless steel, classed plates (Eg - SS316L classed on SA516 Gr 70) to ensure supreme quality and high efficiency. 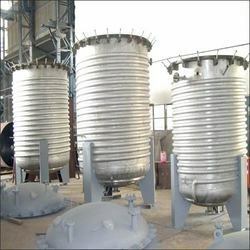 Looking for Chemical Plant Reactors ?